Special thanks to James (Yes, My Real Name Is) Rambo for the Photoshop help. 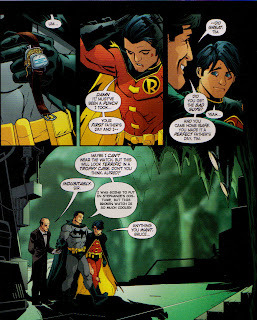 They do have people who REPAIR watches you know Bruce. I suppose I should riot at this grave injustice, but really, Bwa-ha-ha-ha-ha-ha! Stephanie was a good enough detective that she found out one key piece of information: SHE AIN'T NO ROBIN! He can't keep track of each fallen Robin.